FAIRFIELD — The school board continues to look at the best possible use of all its school facilities, but it took steps Monday to reassure parents what it won’t be doing. It won’t consider closing an elementary school, consolidating the two high schools into one, or use “pocket redistricting” — moving a small group of students from one school to another. Milone and MacBroom, enrollment consultants hired by the Board of Education, had come up with a variety of scenarios to deal with better building utilization as well racial imbalance at McKinley Elementary School. Of those, Superintendent Toni Jones identified five that would actually be possible, which included two of the options quickly discarded by the board. Many Sherman School parents showed up at the meeting, urging them to not redistrict their students. The proposed scenario called for moving 98 to 100 students from Sherman to Holland Hill. That, parents said, would be devastating to their children, and to them. “We made a plan when we purchased our home with, where we wanted our children to go to school,” Kathleen Raymond said. She added it would be more costly to the district to have to bus students to Holland Hill who had been walking to Sherman. As for closing an elementary school, Verna Hill resident Mark Shalhoub said he thinks the school board understands the disruption and anxiety this creates. “What’s been happening to our community as a whole, we haven’t recently had that much good news,” Shalhoub said, citing traffic woes, increased taxes, and General Electric leaving. To add talk of closing schools and redistricting creates an anxiety, he said. Even though “pocket” redistricting was not one of the scenarios on the list, the school board added it to the agenda just so that it could definitively vote to reject it. If there were to be any redistricting, board members said, it would be district-wide. Gerber pointed out the town’s past history when it closed elementary schools. Not only did operating budgets continue to increase, the schools later needed to be reopened. 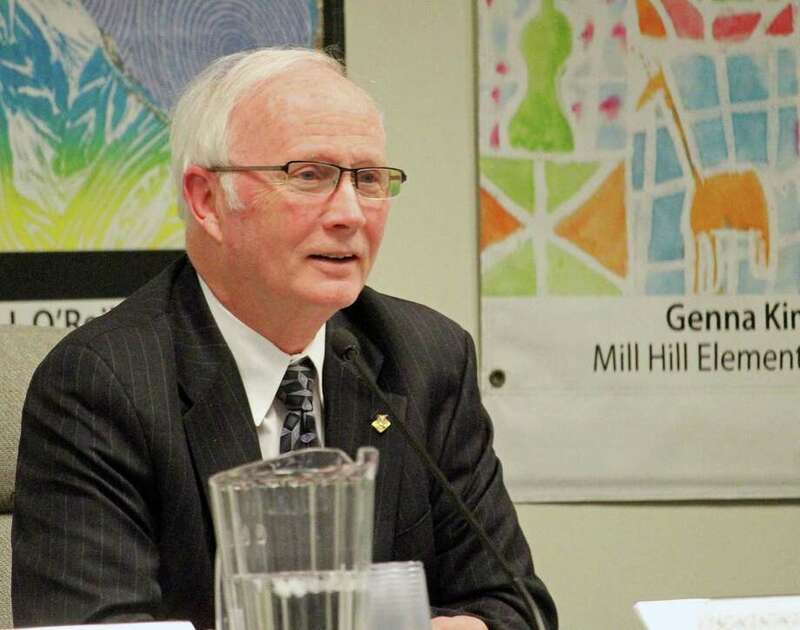 “Those enormous savings you would hope to see by closing not one, but four elementary schools did not happen,” Gerber said. Chairman Phil Dwyer said when he lived in Rye, N.Y., his children’s’ elementary school had just one section for each class. There was really no economic reason to keep it open but by the time his own children were in high school, that elementary school needed portables, and by the time they graduated from high school, their elementary school had an addition constructed. Dwyer said their consultants have said that based on the district’s guidelines on things such as class size and building equity, they really can’t close an elementary school. Consolidating the town’s high schools was dismissed with very little comment. Reconfiguring elementary school grades will stay on the list of possible scenarios, at least for now. “My gut says no, but I would like to be briefed by the administration, on the educational side,” Peterson said. The Milone and MacBroom proposal looks at reconfiguring the grades at McKinley and Jennings, in an effort to eliminate racial imbalance. For example, kindergarten and first grade at one school, the remaining grades at the other. He said he was involved in a recent meeting with the Jennings PTA. “The tone of that room was that they were not in favor of it,” Peterson said. “I don’t know if I’m in favor of it or not,” board member Jennifer Maxon-Kennelly said. “We can’t say no to everything because the first reaction is it’s different.” She said it would be worth finding out the financial and educational impact. Gerber said it would be helpful to get more details, and to truly understand the implications, as a district, or just at two schools. In addition to continuing to discuss grade reconfiguration in the future, the board also agreed to keep the topic of relocating the Walter Fitzgerald alternative high school from its current location on Biro Street.